Berry and Yvonne are experts on the Battle of the Rhine and Liberation of Holland Tours. 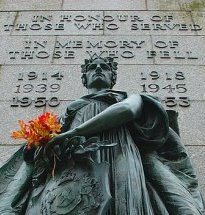 They have been with Canadian Battlefield Tours from the very beginning. They are also the co-owners of a very famous Dutch Restaurant http://www.mondani.nl. 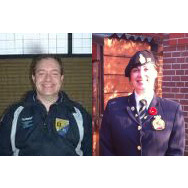 The restaurant also serves as one of only two Royal Canadian Legion Branches in Holland and Yvonne serves on the executive board. The restaurant theme is based on WWII Canadian Military memorabilia and is a local tourist attraction in itself. Berry is the chef and Yvonne is the hostess. Everything about this restaurant is Canadian, right down to Tim Horton’s coffee. The restaurant has catered to all the official Canadian ambassadorial and tourism commission events in The Hague (Den Haag) for over 20 years and over that time they have developed personal friendships with the last four Canadian Ambassadors to the Netherlands. In addition to being a competent battlefield guide, Yvonne also coordinates our alternative spouses program. For example, if a spouse wants a break from the battlefield tours, Yvonne will arrange sightseeing tours unrelated to the battlefields, which may include a trip to the Het Loo Palace in Apeldoorn, shopping, visit to garden centres, bike rides, etcetera.